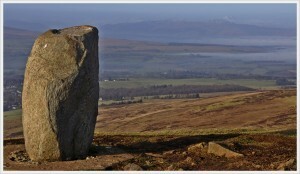 When I lived in Killearn, Dumgoyne was part of a favourite walk and the race was always a good event to watch! 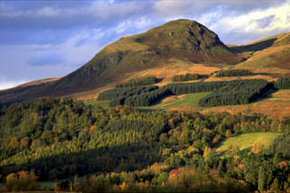 The hill is only 1402 feet high but the position on the edge of the Campsies makes it look a bit higher. The following account of the race is by Manny Gorman. I have a list of six of what I would class as the quintessential “classic” current Scottish hill races; if the Dumgoyne race was still running, it would be seven, sitting very near the top of the pile. If you like your running fast, technical and brutal, then this was the one. The slevering, colourful melee up and down this famous prominent 1,400ft volcanic plug at the south end of the Campsie Hills was held in trust by the best small-to-medium sized running club in the west-end of Glasgow, the mighty Westerlands CCC; but sadly only lasted ten years before the landowner withdrew permission. However, in that short time the race carved out a notch in the hard history of Scottish hill running, never to be forgotten and to be remembered by those who ran it with reverence, and a cold sweat trickling down the back of the neck. A shotgun start at the bottom of the narrow farm track would send off an apprehensive pack immediately into a stupid-fast uphill lunge, and within 200m muscles and lungs would be suffering from painful oxygen debt. The track winds its way up through a beautiful broadleaf wood before the runners would burst into the open field and cross the Water Board track which serves the Loch Katrine pipeline. The pack would have already splintered well apart as the hopefuls and the chancers separated into reality. As a variation on a theme, the tenth and final running of the race was given distinction as a British counter in the Fell Runners Championship, and with such a huge field of runners there was necessity to add an additional small loop in order to allow the pack to split up more substantially before getting onto the hill proper. This entailed the break-out from the woods first being directed back down the grassy field to the bottom, before turning to regain all the precious lost height! The destination was the same. The runners would find themselves climbing, leaping or falling over the twin fences at the slippy wee burn crossing, then turning to face a virtual cliff of grass and rock. With lungs already burning, any further hope of a running ascent could be abandoned by all but the best of the elite as the gradient steepened. Head down, hands pushing hard on knees or thighs, trying desperately to find sustainable rhythm, each step forward and up more painful than the last. Reaching the bottom of the rocky scree a yell from above to warn of a dislodged rock bouncing downhill, and perhaps sussing out your peers, wondering if any uphill overtaking would be advantageous or simply make you blow-up completely? Conveniently you convince yourself that you will get them on the descent instead! Now above the scree and near the top of the steepest grass, in a notch between the crags, the first leading runners come literally flying down towards you with almost total abandon for their personal safety. Arms flailing for balance, rocks kicking up, grunting, slevers flying in all directions, eyes wide but supremely focussed downwards. But not for you, not yet; still the infinite climb goes on before a series of small ledges gives hope of the end. You try to run again but only manage go at the same speed as the guy in front who’s still walking. A shout from above – the top!! 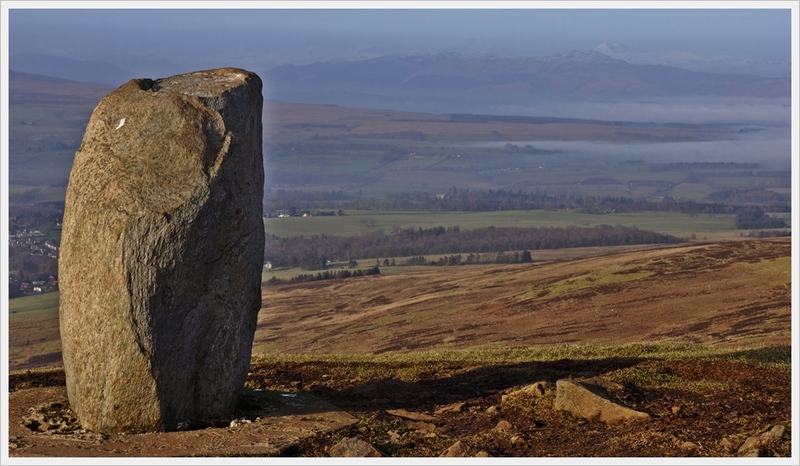 The view from the summit of this wee hill is brilliant – the Blane Valley, Loch Lomond, the Munros to the north, and of course Glasgow laid out to the south. But there absolutely no hope of seeing it in the race as you simply stare for your next foothold or at the runner in front, looking for any weakness. Turn at the summit marshal, the pain eases, ahhh, different muscles, beautiful relief….for about 5 seconds. Suddenly the reversed route requires your complete attention. Speed is quickly up to maximum on the grassy summit ridge, trying to trim the corners and bends off the path ascent route, dodging ascending runners with their heads still down. The grassy notch above the scree at high speed is not for the faint hearted. The up-hillers are hogging the path so you are forced out onto the tussocky stuff whilst maybe fighting off some cheeky bugger trying to pass you. Crossing the traverse path you find your quads are smoking, and knees crumbling but you’re trying desperately not to hold back with the stepped erosion luring you in and forcing you into an unnatural rhythm. The scree arrives. With a tricky entry point it’s only a short fast run for the brave, but fast could gain you a place, or lose you several if you fall on your arse and shred it to raw bleeding beef. You take the gamble and leap into the loose stones only a single step behind the guy in front, and pass him at high speed knowing the horrendously rocky exist is approaching too fast! You re-adjust and hear the guy behind cursing his inferior descending skills and sends a shower of stones rattling painfully around your ankles! You leap out of the rocks and stride off again on the grass, but now nearly back at the twin fences you start to think about holding your place and perhaps reeling in another victim? Avoiding any high speed slithers in the final boggy grass, the fences and burn are crossed and everything you have left, which isn’t much, is thrown into blasting back across the field and plunging back into the dense woods. Here local knowledge applies. To know the corner-cuts through the trees is to know you will gain places over anyone new to the race. Reckless descending with branches whipping your faces and eyes peering for a million deadly tree roots you survive, unsure if you have gained anything, certainly not composure. The final section of track is meant to be fast, but you’re hurting all over and yet you know what is still come – the sting. At the final corner a marshal suddenly points you off the track and headlong towards a fence…instant decision – stop and climb or hope you have momentum enough to hurdle it??! There’s heavy breathing close behind, hurdle it – aaaargh! Woosh, amazingly you’re safely over and into a wall of trees and bushes when suddenly you plummet downwards, feet gripping nothing on an impossibly steep banking, far too fast to be safe, “MIND THE WALL!” a voice cries…Christ! A three foot drop instantly exits you from the bushes and into the grounds of heaven, the Glengoyne Distillery!! A loud crashing noise from the jungle behind warns you, don’t stop, a fifty yard sprint along the footpath to the line and then you can collapse in a heap of pain, snot and slevers on the grassy verge, and it’s all over! With bodies fast piling up at the finish line like a scene from Armageddon, a wonderful hallucinogenic aroma wafts across your salt encrusted dripping face. You recover enough to stand again and instinctively follow the smell to the barbeque stand where free burgers and 12 year old Glengoyne malt whisky are handed to you, although you need to wait for your adrenaline to calm down before you can safely consume it. Runners are still gasping across the line and you are now on your third dram. The noise of races being relived, the sun beating down, the stream supplying the distillery gurgling past, the smells, the craic. Although the hill is still well used by runners for short training trots, or perhaps going further afield to Earls Seat or Slackdhu, nothing can ever come close to the unique experience that was the Dumgoyne Hill Race.